U.S. Lays Out Case For Assad's Culpability In Chemical Weapons Attack : The Two-Way The White House released a declassified report on the attack in Khan Shaykhun. It says the U.S. is "confident" Syria's Bashar Assad was responsible and that Russia is attempting to deflect blame. 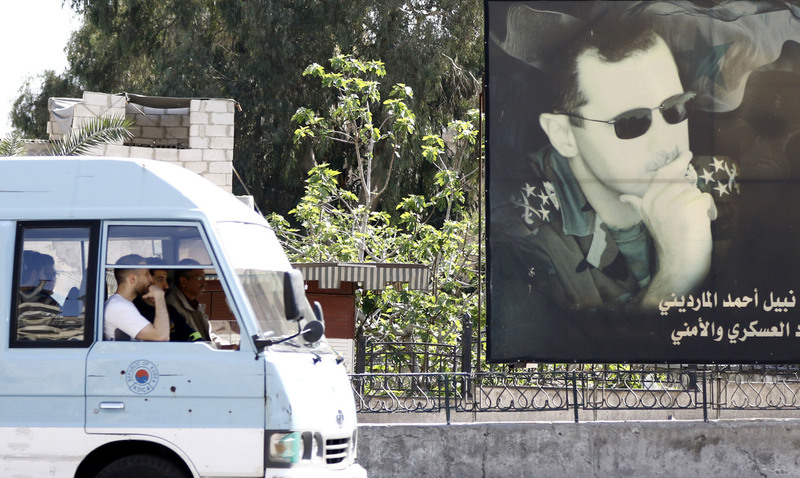 A minivan drives past a portrait of Syrian President Bashar Assad in Damascus last week. U.S. forces fired a barrage of cruise missiles at a Syrian air base Thursday in response to what President Trump called a "barbaric" chemical attack he blamed on the Assad regime. White House officials say the U.S. intelligence community is confident that Syrian President Bashar Assad attacked his own people with chemical weapons on April 4 — and that an alternative explanation offered by Russia is an effort to deflect blame and "confuse the world community." Senior administration officials "suggested that the attack may have been motivated by rebel gains in the surrounding area, as rebel forces approached a strategic Syrian air base," NPR's Scott Horsley reports. "They said there was no consensus on whether the Russians were involved in the attack or had foreknowledge of it," he adds. The attack on the town of Khan Shaykhun killed scores of people, including numerous children. Soon after the strike, experts said that victims' symptoms suggested a toxic chemical was used — specifically the potent nerve agent sarin. World leaders, including President Trump, immediately accused Assad of using chemical weapons against his own people, again, in violation of international accords. But Russia maintained that a conventional weapons strike by the Assad regime accidentally hit a stockpile of chemical weapons that belonged to rebels or terrorists. Hassan Youssef, a 40-year-old victim of the April 4 chemical attack in Khan Shaykun, receives medical care in a hospital in the nearby Syrian city of Idlib on Thursday. In response to the attack, the U.S. launched 59 Tomahawk cruise missiles Thursday in a strike targeting a Syrian air base. Now a declassified report released by the National Security Council reiterates that the U.S. is confident Assad's forces carried out the April 4 chemical attack and lays out the intelligence community's reasoning — without including classified information used in the analysis. The report says the U.S. relied on "signals intelligence and geospatial intelligence, laboratory analysis of physiological samples collected from multiple victims, as well as a significant body of credible open source reporting." "We are certain that the opposition could not have fabricated all of the videos and other reporting of chemical attacks," the report reads. The report says that "pro-opposition social media reports" began suggesting an attack shortly before 7 a.m. local time on April 4, while Russia's explanation maintained an airstrike occurred around noon local time. There's also video and satellite imagery suggesting the attack hit "in the middle of a street," not a storage depot, the NSC report says. And while ISIS has used some chemical weapons, such as mustard gas, there's no evidence that this attack "involved chemicals in ISIS's possession," the White House says. The report cites previous Russian attempts at distraction, deflection and obfuscation, identifying a pattern of "attempting to undermine the credibility of its opponents" and bolster the Assad regime. The report does not come to a conclusion about whether Russia bears culpability in the attack itself — that is, whether Russia had advance knowledge of the attack or cooperated in it. But it states strongly that Moscow was attempting to "create confusion and sow doubt" to distract from the evidence against Assad. At a White House press briefing on Tuesday, press secretary Sean Spicer said Russia was "isolated" in its support for Syria. "Russia is on an island," Spicer said. "The facts are on our side."